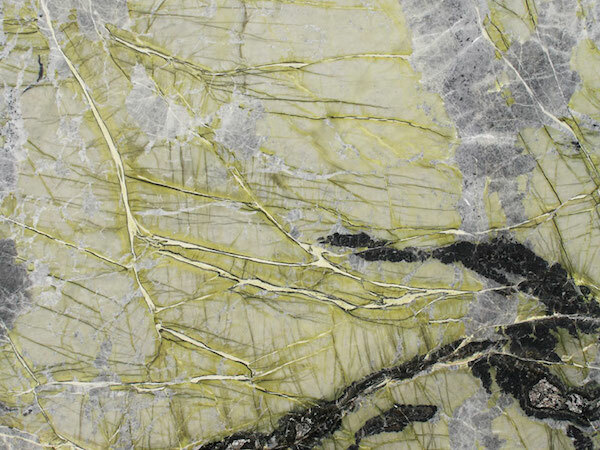 Appearance: A mixture of large white veins resulting from calcium compounds, lime green veining originating from copper compounds, and greys and blacks from organic compounds. In short, it is a snapshot of British geological history. Properties: This stunningly beautiful British stone is the only true marble on mainland Britain. It offers good physical, mechanical and technical characteristics. Colour variations and movement occur, even in the same batch. It is recommended to seal this stone to extend its longevity. Use: Drumrunie Green marble is suitable for floors and wall cladding in interiors, as well as bespoke stonework, including stairs, fireplaces, vanity tops and shower trays. Like most marbles, special care is required for kitchen worktops and other surfaces subject to acid liquids (e.g. lemon juice and vinegar), which would take the shine off and cause discolouration. This phenomenon occurs with all finishes, but is more visible with a polished surface. Formats: Tiles, slabs (typical size is 2x1m) and cut-to-size.